So Good Spare ribs are so succulent that when you consume them you are going to ask yourself "how did I get this far in life before tasting these fabulous ribs?" Years ago, Chris and I purchased an Electric Wok. Now back then it was all the rage, and while Chris was not a big fan of Asian cooking (still not today) we did enjoy using the appliance until we wore out the Teflon coating. Included with the Wok was a recipe book that Chris used. When we moved, the book was packed away. We discarded the Wok and the recipe book remained packed until Chris said she remembered a barbecue recipe that was so good with spare ribs. When Chris asks about a recipe that is totally off the radar screen, I was on a mission to find the Ribs recipe! Well, after spending some time in the basement I came across Ceil Dyer's 1977 edition of wok cookery. The pages, all water wrinkled from a combination of damp basement and a minor water leak, none-the-less I found this mouth watering spare rib recipe. In fact, the page was still marked with a recipe card for the Ribs. 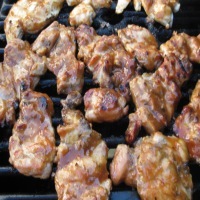 The recipe actually works well and goes good with Sirloin tips as well as with chicken and weighs in for about 2 pounds of beef, pork or chicken. However, the So Good Spare Ribs are great! Fathers Day came and I wanted to share this delight with my son-in-law so Chris and I decided to bring the barbecue to him. After recalculating the ingredients for 7 pounds of pork I started the slow roasting early that morning. Prior to cooking the ribs, I prepared the sauce without cornstarch and applied it to Sirloin tips. Wow, still as good as Chris remembered. (Cornstarch makes the sauce thick). For me it was like a new explosion of taste. The sauce was not thick, so much of it ran off the beef, but was still a fantastic taste sensation. Depending on how much spark you want to give it, either add more horseradish or worcestershire sauce, or both! Also, light brown granulated sugar can be used as a substitute for the regular brown sugar, but it will need to be heated in order for it to blend smooth. Barbecue sauce is not a "crunchy" event, only the meat can get crunchy. If you have a Wok, follow the instructions below. If you need a wok, here is a moderately priced wok that will service you for years to come. If you have a Nesco Roaster cook the meat with a quarter of the sauce. Also, spare ribs have a fair amount of fat. Trimming the excess fat off is recommended. Cook to desired tenderness but do not let the meat get to the point where it just falls apart. It just won't stay whole when on the grill. Place trimmed spareribs on a rack in wok over simmering water. Cover and steam for 45 minutes or until tender. Place in a long baking dish. Place dish on rack in wok over simmering water. Cover and steam for 30 minutes. While steaming, thicken sauce with dissolved cornstarch. Spoon over ribs and serve hot. Prepare the sauce in a medium size bowl. Add the brown sugar then the cider vinegar, catsup, mustard, Worcestershire sauce and horseradish. Blend using a hand whip until all is smooth. Add cornstarch and continue to blend until sauce thickens. Pour approximately 1/4 of the sauce into the Nesco. Add the meat coating both sides. Cook until tender then remove and let cool. Fire up your grill and when hot, put meat on grill and cook until grill marks appear. Turn then brush on sauce remaining in bowl. Turn again and brush on sauce adding as much or as little as you desire. Heat remaining sauce and serve with entree. 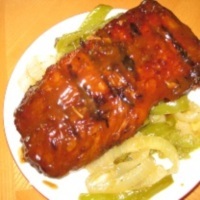 Return to Easy Everyday Cooking Recipes from Spare Ribs.